Enter the login details to a user inbox created on the Microsoft Exchange server. The account requires no special permissions. 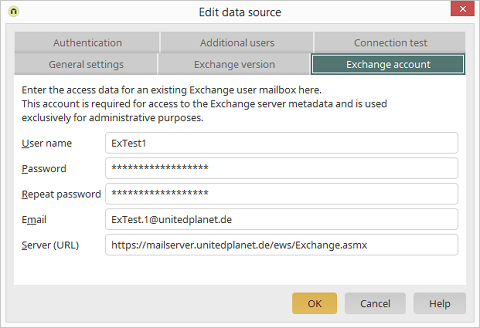 The Connector for Microsoft Exchange will use this account to query meta-information from the Exchange server, which will then be available when creating applications, and delivers information about data fields, field types, and existing tables. Enter the name of the Exchange inbox or the email address. Make sure to use the primary inbox address. If you use an alias address, the functionalities of the Connector may be limited in some cases. Enter the domain and the URL of the Microsoft Exchange server with the Client Access Role (e.g. the OWA server). Usually, the URL begins with the protocol https followed by the fully qualified server name and the virtual directory exchange (2003/2007) or /ews/Exchange.asmx (Exchange 2010 or higher). If you are using Microsoft Office 365, simply enter "Office365" here.